Natural Family Planning, Part One! Chastity doesn’t mean abstinence, but rather integrating one’s sexual impulses into love. That’s obviously important in marriage. 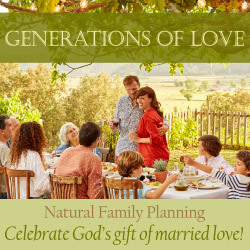 Anticipating Natural Family Planning awareness week (July 22-28), we talk about NFP with Amy and Duston Stout, Mark and Leslie Wolf, and Rachel and Dax. Tons of information on NFP is available at the USCCB website. For example, here’s a page with current medical research about fertility awareness. If you are interested in finding a class, here’s a directory that includes programs with distance learning.